It was with barely contained excitement that the 8000 plus crowd moved into the Riverstage venue in Brisbane to see some of the most cutting edge, ground breaking bands of our generation. Thy Art is Murder took to the stage with little ceremony or pomp as the audience took their place in the quickly filling venue. The heavy deathcore sounds which define them as one of Australia's heaviest exports were very welcome and saw the band perform a smattering of songs from 'Dear Desolation', 'Holy War' and 'Reign of Darkness'. It was great to see frontman CJ McMahon back at the helm with his charismatic, funny banter contrasted heavily against the brutality of songs like 'Puppet Master'. 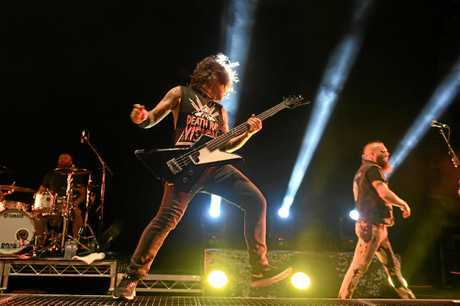 Killswitch Engage burst onto the stage next with vocalist Jesse Leach leading the charge as the band tore from one end of the stage to the other. They hardly stood still for a second and moved through 'My Curse', 'Just Barely Breathing', 'My Last Serenade', 'The End of Heartache', 'Hate By Design' and 'In Due Time'. Adam D provided some witty banter but it was a no frills set squeezing as many songs in as possible. Adam, the producer of the first two Parkway Drive albums, was looking mean and focused and it was great to hear the tone and melody of the songs sounding crisp and clear. 'End of Heartache' and 'My Curse' got some of the loudest reactions from the crowd and it was super fun to watch them perform with flawless ease. This honestly must have been one of the most feel, good, positive, high energy gigs Riverstage has ever seen despite the fact it was underpinned by brutally heavy guitar. Between Thy Art, Killswitch and Parkway there honestly was nothing but positive energy and smiles. 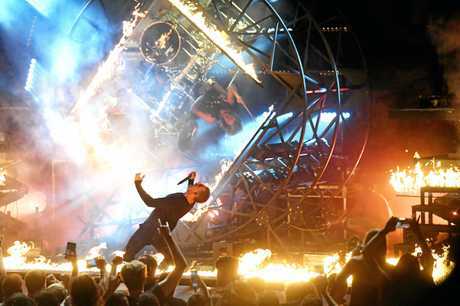 It is tempting to say Parkway Drive's latest tour is epic, amazing and awe inspiring. The general sentiment is that they're next level when it comes to live performance but that seem inadequate in this instance. Parkway Drive are a collective of highly professional guys with the upmost respect for their fans whom that aim to please. They try to give the most unique live music experience possible. The sold-out show at Riverstage in Brisbane was a testament to this. It was almost as much fun listening to the audience's reaction as it was to watch the band. More than one person could be heard exclaiming on exiting the venue that the show had been the best Parkway Drive show they had ever seen. But we will come back to that, lets go to the very start. After some favourite aussie classic tunes the stage went black and an ominous drone filtered through the speakers. An unannounced barrage of pyrotechnics exploded to the gasps in the audience who could feel the shockwaves of the giant explosions. 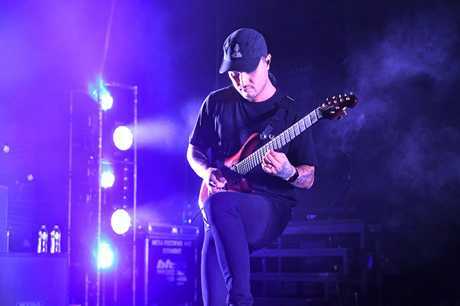 From out of the smoke emerged the band dressed fully in black, with Jeff Ling being replaced by Thy Art Is Murder guitarist Andy Marsh for this tour. Winston, who delivered some of his lowest and most aggressive vocals, launched into Wishing Wells, and it proved just how powerful and strong these songs are off the new album Reverence. Following a solid, aggressive and tight rendition of Prey, which saw the mountain of people on the hill surging with the energy, the band played Carrion. It was great to see 'Carrion' dropped into the set, while Vice Grip from Ire saw the loudest sing along of the evening with fist pumping in the air and the mosh pit becoming a full surging force. With the audience singing "ONE LIFE, ONE SHOT, GIVE IT ALL YOU GOT" it was the very incarnation of the five men on stage giving it everything to produce the performance of their careers. The lighting, sound and performance were technically flawless and 'Dedicated' and 'Absolute Power' rung out across the giant hill with moshers fighting a flurry of elbows and shoulders as the crowd continued to get more and more pumped. 'Dedicated' for me still stands out as one of the most aggressive and powerful statements about how hard they have worked and how unstoppable the band is and it has such a gnarly dirty riff that drops into such a crunch and meaty verse section it was absolutely fantastic to hear it in the set. It mirrors the sentiment in 'Shadow Boxing' played later in the set which is another statement about the band doing things on their own terms without compromise. The rain started to fall and it only added to the atmosphere with no one budging a millimetre. All eyes were locked on the stage. This gave way to the first real departure from previous shows and the first unveiling of the grand focus and concept behind the show - cue an unexpected song from Reverence. It was a powerful moment and effective change of pace as the band started 'Cemetery Bloom' which saw the lights drop to an epic white stage light bathing Winston as he proceeded to giving a stirring rendition of the song. It was absolutely fantastic to have the ferocity of the previous songs molded and book-ended with the power of the new material in such a spectacular and well thought out show. If the hair on the back of your neck didn't stand up with the next song then you weren't paying attention. With a roar of fire and rain, Winston's cry "WELCOME TO A WORLD OF PAIN" was truly like a call to arms and with thundering drums the band launch into 'The Void'. 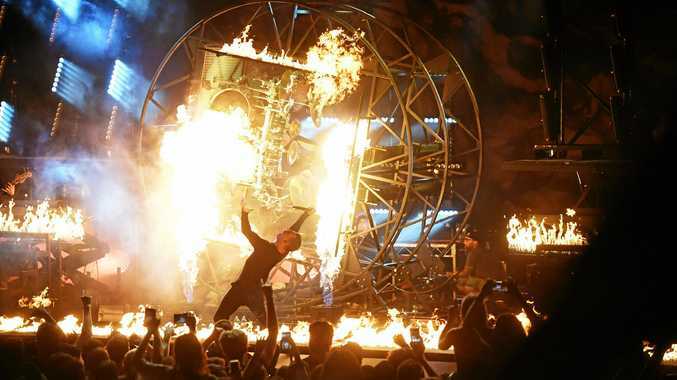 With steam, sweat, rain, fire, smoke, lights all mixing to create the perfect level of insanity an unparalleled metal show it was clear the giant machinery of this production was seamlessly coming together. 'Idols and Anchors' provided a return to an old favourite and those super identifiable lead riffs providing a nostalgic moments from hundreds of shows played across Australia in all sorts of venues. The songs have such pathos you can remember where you were when you first heard them live. 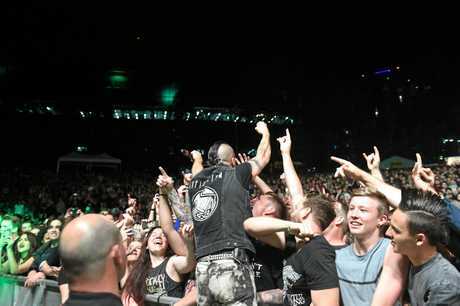 None more so than 'Karma' which gave way to the biggest circle pit of the evening and possibly the biggest Riverstage has ever seen. A few seconds into the song the band stopped and encouraged the crowd to help them win a bet. The bet was whether they could get the circle pit to move up the hill. And sure enough like a beast with a mind of its own the pit opened up and continued to open all the way up the hill towards the sound desk much to Winston's delight. It was incredible to watch it get faster and spread wider in perfect unity as it spread across the ground. Once again it was time for the production design to come into play and while most people could have left satisfied at that point with the show already surpassing the stage production of previous shows, it was time for another surprise. Four classical musicians were brought on stage in darkness while Winston and Marsh were up on the high rises. Through the smoke, like a clearing battlefield, you could hear the mournful tones 'Writings on the Wall' and honestly it was such a privilege to be able to witness the song played with such depth and soul. The musical ambience of the classical instruments amplified the melody and the meaning in the song and once again the crowd were spellbound. 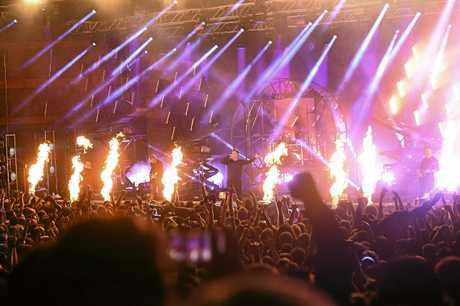 With 'Shadow Boxing' the rap, the metal, the classical sounds all came together in a perfect intersection to provide a new never before seen version of Parkway Drive. 'Wild Eyes' amped the crowd, who by this stage were wild eyed themselves, as it was impossible to predict what would come next. Marsh's guitar parts sung loud across the field of delighted faces and he should be highly commended for not only filling the role, but being able to provide the emotion and intensity to the songs. Winston admitted at this stage that he had been struggling with his voice but had found a way to dig deep and still perform as it meant so much to them to be able to put this show on at Brisbane. 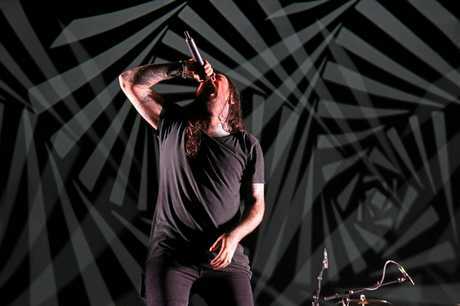 It is hard to imagine that three hours before the show he was struggling to overcome the fatigue that had sapped his vocal chords, and somehow, someway, using his vocal training and techniques he was able to walk on stage and find a way to produce the most intense sound ranging from guttural growls to full harmonic singing. It is the exemplification of the determination that this band has shown throughout its years climbing to the top. And with that, Parkway Drive revealed the ace up its sleave. 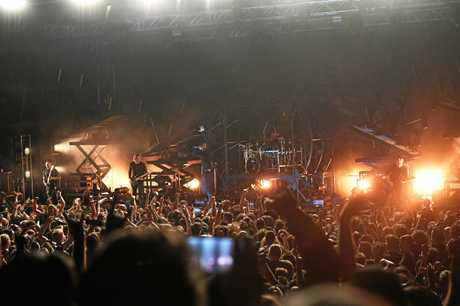 The huge stage setup, which had the audience gasping at the beginning of the show when the black curtain fell to reveal the circular steel contraption that surround Ben Gordon's drumkit, now burst to life. 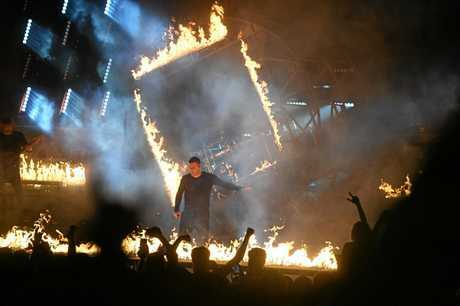 Fire spread from one end of the stage to the other and around the circumference of the square frame on the drumkit. 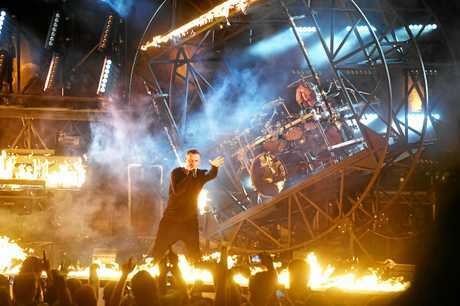 With drumkit now spinning and Ben Gordon flawlessly providing the drums for Crushed, and Winston standing surrounded by flames the audience's reaction was priceless, mostly punctuated by 'Get F***cked'. The ominous, ground shaking tones of this song were matched with more rain, and more fire, and more fists pumping into the air. Bottom Feeder was the last song, and with the band fully committed and the audience fully committed there was no turning back. It was the culmination of fifteen years of hard work and professionalism, enduring relationships with a solid team of experts in sound and design, recording, and video and film, and an incredibly strong support network of friends and family, all standing under one sky as fireworks erupted to close the set.